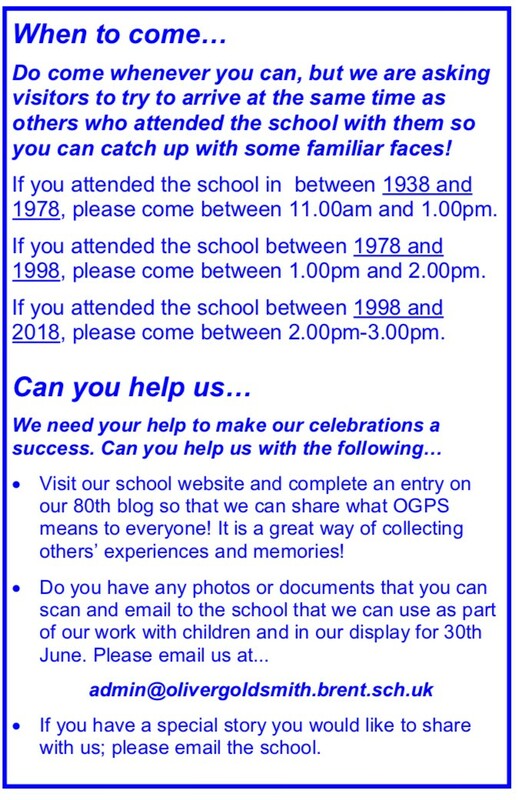 This page will give you lots of information on how we will be marking 80 years of OGPS! Please do pass the word to past pupils, past members of staff and those in our local community who have links with the school. Together we can make it a year to remember! On Saturday 30th June, we are holding an open day to bring past and present OGPS pupils, staff, governors and friends from the local community together. Come along 11.00pm-3.00pm and catch up with faces from the past and find out about OGPS present and future! 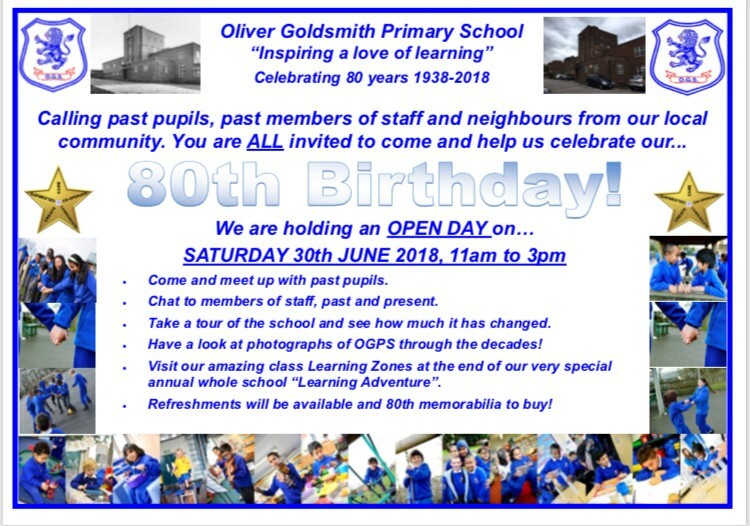 Here are the details, you can download our invitation here.... 80th Celebrations Invitation 2018.pdf Do spread the word, we want it to be a day to remember! We launched the year by giving out special badges and holding some special assemblies to help the children know that it will be a very special year. The badges are special edition for children in the school this year, there will be other badges and merchandise available for people to buy to mark this special time! Launched our School Blog, reaching out to past pupils and staff..... CLICK HERE to read what our past alumni have to say about OGPS. If you have a past connection to the school, please add your experiences o our current pupils can ;earn that little bit more from the past. Shared Log Bookand Punishment Book extracts on the school website. We held a special assembly for current staff and pupils on Thursday 8th February 2018 as this day marked the actual 80th anniversary of the school opening. "Birthday Card Challenge"Could you send us a birthday card to share with pupils on Thursday 8th February 2018? Is there a special message you would like to pass onto the current OGPS pupils to mark this moment in history? 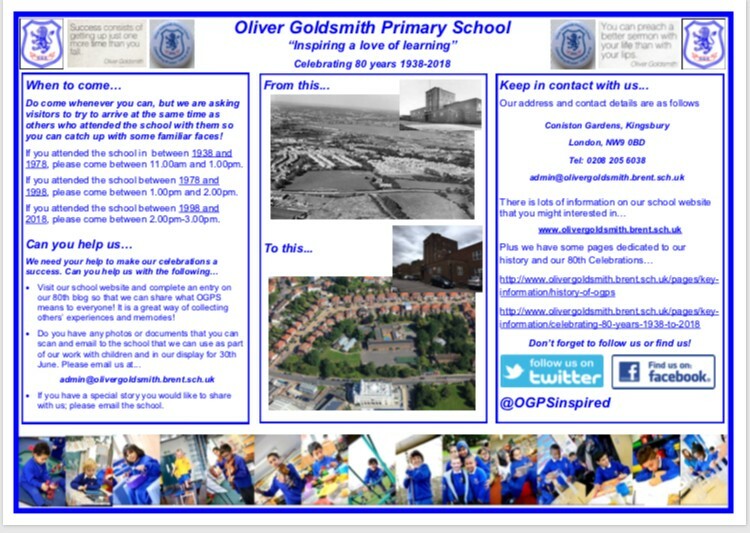 Send us a card, marked 80th Birthday to the school address and we will make sure it shown to the pupils! Summer Term 2018 - Time for "THE BIG EVENT"
We held an OPEN DAY on SATURDAY 30th JUNE, visitors took tours and of the school building, visited classrooms and the playground, met past pupils and members of staff, saw the work the children completed as part of our amazing annual Learning Adventure and lots more!